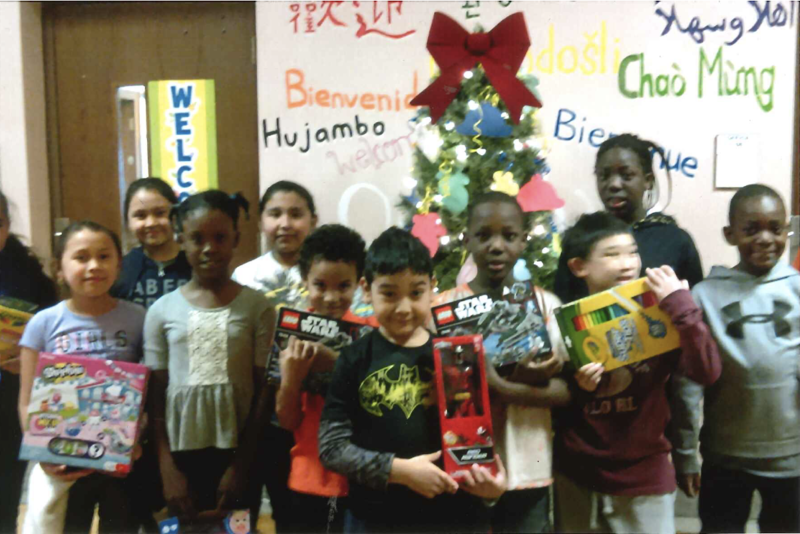 Photo of the students at Oak Hill Elementary with their holiday gifts from Shaare Emeth. As a fifth year volunteer at Oak Hill Elementary, I cannot say my enthusiasm has dwindled. I look forward to the south city immigrant neighborhood, to the big bright eyes and to the smiling faces. The two kindergartens have the most patient and skilled teachers. My job consists of support. Mostly I encourage, cajole, praise, reward, tutor, discipline (i.e., keep commotion to a minimum), and listen. Sometimes listening is my most important role. This is the time of year we start to see progress. ‘M,’ who arrived in October without a word of English, now sounds out words. ‘D,’ who was always on the move, never sitting, stayed at my table this week with his group, working on three-letter words for the entire ten-minute period. But this year there was another difference as well. Our classrooms didn’t run out of crayons or pencils because of the generosity of the members of Shaare Emeth during our school supply drive. So many of you brought items from our wish list to services and to the picnic. The teachers have taken notice. One of thank you cards from the students at Oak Hill. 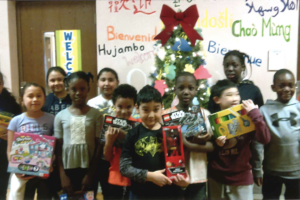 Shaare Emeth’s Holiday Gift Wish List was also such an amazing success! 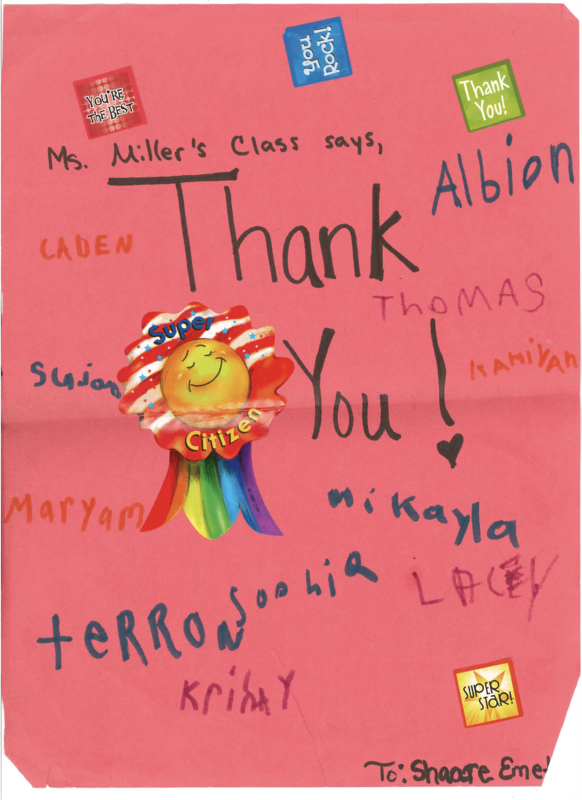 We received thank you notes and a photo of the children holding up their favorite toy. I saw the gigantic pile of over 125 wrapped gifts for 22 children and was overwhelmed. The numbers of coats, warm sweats and jeans means a lot to each child and brought a lot of joy and comfort. So if your contributions were in pencils, notebooks, crayons, warm socks and jeans, or in expert wrapping of gifts, know that it was all truly appreciated by the Oak Hill family. And by the several Shaare Emeth teaching volunteers!